Henri Giroux is one of the most influential thinkers of the 20th century and 21st century, making significant contributions to the fields of education and cultural, youth, and media studies. Have Paper Masters custom write research on Henri Giroux, one of the most important men of the 21st Century. Explore Giroux's theories, writings or life's work in a research paper that is written according to your guidelines and guarenteed to be done exactly how you dictate. 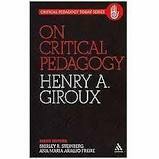 Giroux may be best known for his theory of critical pedagogy. This theory contends that educational practices must be guided by the desire to empower students. Important components of the critical pedagogy theory include the interconnection of knowledge from a variety of disciplines, the importance of individual power and identity, curricula that are built around the lived experiences and everyday knowledge of individuals, and an awareness of how words used by educators can shape cultural practices. Giroux is a strong supporter of not only education in general, but more specifically, public education, which may be viewed as an institution that develops critical thinkers who act responsibly towards the public. Education should foster in students the ability to critically challenge existing assumptions and myths in society that serve as the foundation for disempowering social practices. Rather than serve as a form of indoctrination, Giroux contends that education enables human society to continually reflect upon itself and grow. Paper Masters writes custom research papers on Henri Giroux and discusses Henri Giroux, one of the most influential thinkers of the 20th century.